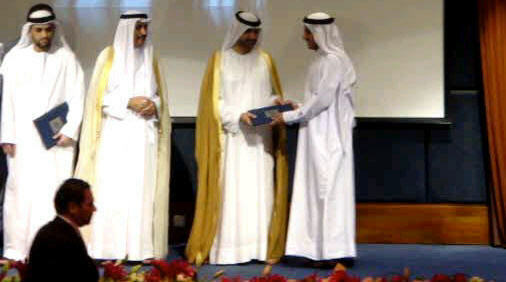 This came during a ceremony honoring the winners of the Sharjah Economic Excellence Award 2008 held on Wednesday (May 27, 2009) at the main building of the Sharjah Chamber of Commerce and Industry, as City Properties Real Estate received the Appreciation Certificate for they category of large enterprises sector. Under the patronage of H.H. Sheikh Abdullah Bin Salem Al Qassimi, Deputy Ruler of Sharjah, who attended the special ceremony to honour the winners of Sharjah Economic Excellence Award 2008 . The Chairman expressed his great pleasure saying:- it's A huge Accomplishment receiving this prestigious Appreciation Certificate is a compliment to our efforts, and we can only offer our sincere gratitude and deep appreciation to the Government of Sharjah and the Chamber of Commerce and Industry for their continuous support for the Real Estate sector in the emirate.This support, which played a vital role in the growth of our business. On this occasion, I would also like to thank all City Properties employees for their tireless efforts and commitment to teamwork, which has had a great impact on the achievement of these successes, as we continue to achieve success after another, and we look forward to further achievements in the future in light of the expansions of City Properties Real Estate and the growth of its business. H.H. Sheikh Abdullah Bin Salem Al Qassimi, Deputy Ruler of Sharjah and Mr. Abdulla Al Shaibani, Chairman of City Properties Real Estate receiving the Certificate.